Bring rustic elegance to your backyard using the Heartwood The Woodcutter Bird House. The round body adds character to this piece, while its peaked roof with copper ridge attracts attention. Individual shingles on the roof lend more color to the unit, and a wing-like gable at the top celebrates birds in a fantastic new way. Varied brown, black, and red tones throughout the unit help it earn its storybook name. The center of the home has an inset, 1.5" diameter entrance hole, allowing birds to access their new roost. Its pitched roof keeps the interior dry, and the base is removable for maintenance. The included mounting plate enables you to display this piece on a 4 x 4 post easily, offering just the right height for songbirds. Ventilation slots beneath the roof, coupled with the cypress body, ensure that the home maintains a proper temperature for nestlings. 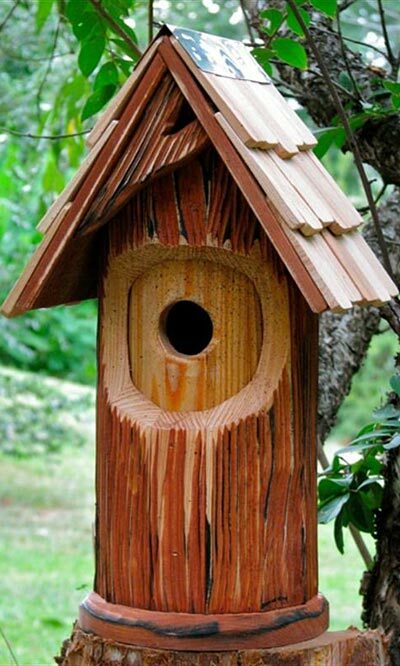 Add rugged style to your bird garden with The Woodcutter Bird House. Made in the USA.